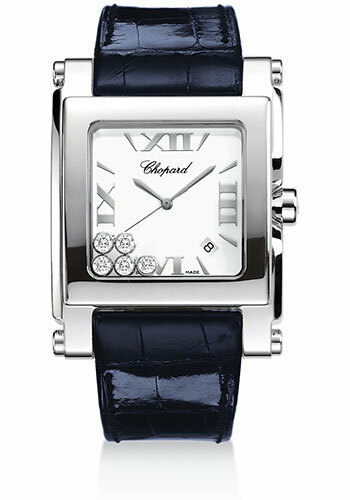 Extra large size (35.5 mm x 46.5 mm) stainless steel case 5 moving diamonds, white dial, quartz movement with date at 4 o'clock, leather strap. Water resistant to 30 meters. Extra large size (35.5 mm x 46.5 mm) stainless steel case 5 moving diamonds, diamond bezel, white dial, quartz movement with date at 4 o'clock, leather strap. Water resistant to 30 meters. Extra large size (35.5 mm x 46.5 mm) stainless steel case 5 moving diamonds, white dial, quartz movement with date at 4 o'clock, stainless steel bracelet. Water resistant to 30 meters. Extra large size (35.5 mm x 46.5 mm) stainless steel and 18K yellow gold case 5 moving diamonds, mother of pearl dial, quartz movement with date at 4 o'clock, leather strap. Water resistant to 30 meters.